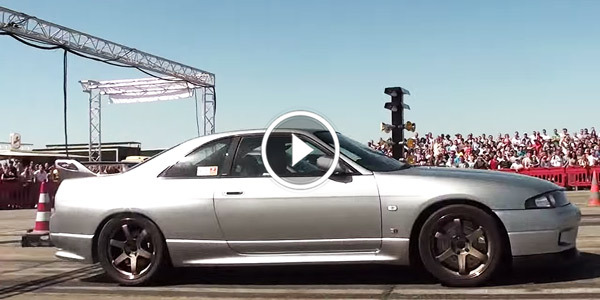 NISSAN SKYLINE GTR R33 Vs PORSCHE TURBO! Place Your Bets! Both of these babes, the Nissan Skyline GTR R33, and the Porsche, are being considered as the very best and fastest GT cars ever built. And taking into an account that we are talking about two completely different manufacturers, it would not be wrong if we call it a Japan Vs Germany battle. So, what we have here, in the following video that we have prepared for all of you who love watching drag races between these types of cars, is the legendary Japanese rocket-sled, the Nissan Skyline GTR R33, powered by an engine that is boosting more than 650 HP, and the German pride amongst the GT cars, a Turbo Porsche. Unfortunately, we do not have the info about what is that Porsche packing, and how much power is generating, but we have no doubts that it is pretty mighty. However, watching it battling against the Japanese legend, it does not look that convincing, if you ask me. The GTR R33`s launch is nothing less but perfect, and even though later on the Porsche accelerates pretty fast, it stands no chance with it. I know that this was a major spoiler for all those who wanted to see the whole thing for themselves, but somehow, I could not help it! But I`m pretty sure that this would not bother you to enjoy the race. So go ahead and check it out, and if you want to learn something about the legendary GTR R33, go to this link.